A Japanese garden design aims to bring peace and tranquillity. This Japanese garden celebrates the natural environment. 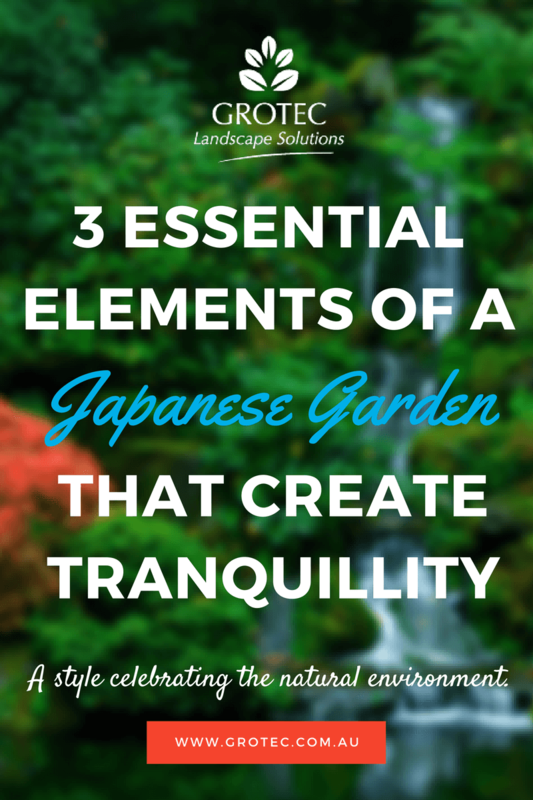 Essential elements of a Japanese garden design are stones, water, and plants. There are three different styles of Japanese garden design, all of which aim to recreate the natural scenery. The variations in these styles comes from the interpretation of the elements, which is either natural or abstract. To duplicate these in our climate needs careful planning. The stone element has rocks as the foundation of the design, where the shapes and angles of the stones are elaborate, and look great. The entry should be marked by a large stone, with the traditional carved stone lantern. These are, however, expensive, and are now generally replaced by lanterns of metal and glass combinations. Rocks should look natural. Water, the fundamental element of life, is shown as a pond, or a simple water fall that will enhance the Japanese Garden. If there is not room for a water feature, then a dry stream of small white pebbles can represent the water. Raked sand or gravel will represent rivers, and the rocks become islands. In larger constructions a distinctive bridge is built over the water. In ponds, koi are added for a flash of orange, with water lilies and other aquatic varieties, and around the pool rim, perhaps Japanese irises. The Japanese Garden can include a range of plants. The conifers and other evergreen varieties are considered the ‘backbone’ of the design. Dwarf Hinoki cypress (Chamaecyparis obtusa), Golden gap yew (Taxus cuspidata), and Heavenly Bamboo (Nandina domestica) can form the basis of the garden. Hedge Bamboo can be used to mark the edges of the Japanese Garden. Let Grotec design the Japanese Garden to invigorate and rejuvenate you. Deciduous plants provide colour, Japanese maple (Acer palmatum), or Red Robin (Photinia glabra) can be included, or for the purely green garden, NZ flax (Phormium tenax), Tree ferns (Cyathea var. ), and hostas give form and texture to the Japanese Garden Design. Weeping, flowering trees such as Japanese Cherry (Prunus serrulata), Fushia (Fuchsia hybrids) plus some of the Australian natives, like White bottle brush (Callistemon viminalis) add to the beauty of the garden. As well there are the Wattles, or Forsythia suspense to add. The key to a Japanese garden design is simplicity – ‘less is more’ – and the design should blend the near, far, low, and high aspects of the garden, and be in proportion and graceful. The Japanese Garden offers calmness and beauty, and Grotec can make it happen!